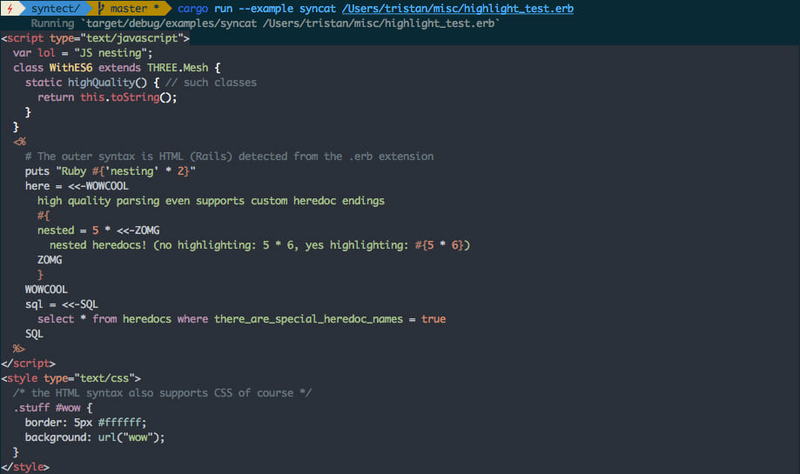 syntect is a syntax highlighting library for Rust that uses Sublime Text syntax definitions. It aims to be a good solution for any Rust project that needs syntax highlighting, including deep integration with text editors written in Rust. It's used in production by at least two companies, and by many open source projects. If you are writing a text editor (or something else needing highlighting) in Rust and this library doesn't fit your needs, I consider that a bug and you should file an issue or email me. I consider this project mostly complete, I still maintain it and review PRs, but it's not under heavy development. After that take a look at the documentation and the examples. to fetch all the required dependencies for running the tests. API allows use in fancy text editors with piece tables and incremental re-highlighting and the like. High quality highlighting, supporting things like heredocs and complex syntaxes (like Rust's). Include a compressed dump of all the default syntax definitions in the library binary so users don't have to manage a folder of syntaxes. Well documented, I've tried to add a useful documentation comment to everything that isn't utterly self explanatory. Built-in output to coloured HTML <pre> tags or 24-bit colour ANSI terminal escape sequences. 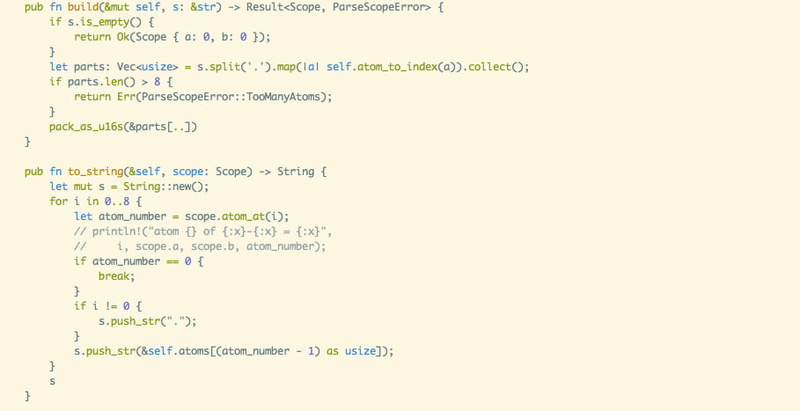 Nearly complete compatibility with Sublime Text 3, including lots of edge cases. Passes nearly all of Sublime's syntax tests, see issue 59. Load up quickly, currently in around 23ms but could potentially be even faster. There's currently an example program called syncat that prints one of the source files using hard-coded themes and syntaxes using 24-bit terminal escape sequences supported by many newer terminals. These screenshots don't look as good as they could for two reasons: first the sRGB colours aren't corrected properly, and second the Rust syntax definition uses some fancy labels that these themes don't have highlighting for. Prints highlighted lines of a string to the terminal. See the easy and html module docs for more basic use case examples. Parallelize the highlighting. Is this even possible? Would it help? To be determined. The current perf numbers are below. These numbers may get better if more of the things above are implemented, but they're better than many other text editors. All measurements were taken on a mid 2012 15" retina Macbook Pro. Textmate 2, Spacemacs and Visual Studio Code all take around 2ish seconds (measured by hand with a stopwatch, hence approximate). Vim is instantaneous but that isn't a fair comparison since vim's highlighting is far more basic than the other editors (Compare vim's grammar to Sublime's). These comparisons aren't totally fair, except the one to Sublime Text since that is using the same theme and the same complex definition for ES6 syntax. Simple syntaxes are faster, JS is one of the most complex. It only takes 34ms to highlight a 1700 line 62kb XML file or 50,000 lines/sec. ~138ms to load and link all the syntax definitions in the default Sublime package set. but only ~23ms to load and link all the syntax definitions from an internal pre-made binary dump with lazy regex compilation. ~1.9ms to parse and highlight the 30 line 791 character testdata/highlight_test.erb file. This works out to around 16,000 lines/second or 422 kilobytes/second. ~250ms end to end for syncat to start, load the definitions, highlight the test file and shut down. This is mostly spent loading. Syntect makes heavy use of cargo features, to support users who require only a subset of functionality. In particular, it is possible to use the highlighting component of syntect without the parser (for instance when hand-rolling a higher performance parser for a particular language), by adding default-features = false to the syntect entry in your Cargo.toml. For more information on available features, see the features section in Cargo.toml. Because syntect's API exposes internal cacheable data structures, there is a caching strategy that text editors can use that allows the text on screen to be re-rendered instantaneously regardless of the file size when a change is made after the initial highlight. Basically, on the initial parse every 1000 lines or so copy the parse state into a side-buffer for that line. When a change is made to the text, because of the way Sublime Text grammars work (and languages in general), only the highlighting after that change can be affected. Thus when a change is made to the text, search backwards in the parse state cache for the last state before the edit, then kick off a background task to start re-highlighting from there. Once the background task highlights past the end of the current editor viewport, render the new changes and continue re-highlighting the rest of the file in the background. This way from the time the edit happens to the time the new colouring gets rendered in the worst case only 999+length of viewport lines must be re-highlighted. Given the speed of syntect even with a long file and the most complicated syntax and theme this should take less than 100ms. This is enough to re-highlight on every key-stroke of the world's fastest typist in the worst possible case. And you can reduce this asymptotically to the length of the viewport by caching parse states more often, at the cost of more memory. Any time the file is changed the latest cached state is found, the cache is cleared after that point, and a background job is started. Any already running jobs are stopped because they would be working on old state. This way you can just have one thread dedicated to highlighting that is always doing the most up-to-date work, or sleeping. Since 3.0, syntect can be used to do parsing/highlighting in parallel. SyntaxSet is both Send and Sync and so can easily be used from multiple threads. It is also Clone, which means you can construct a syntax set and then clone it to use for other threads if you prefer. Compared to older versions, there's nothing preventing the serialization of a SyntaxSet either. So you can directly deserialize a fully linked SyntaxSet and start using it for parsing/highlighting. Before, it was always necessary to do linking first. It is worth mentioning that regex compilation is done lazily only when the regexes are actually needed. Once a regex has been compiled, the compiled version is used for all threads after that. Note that this is done using interior mutability, so if multiple threads happen to encounter the same uncompiled regex at the same time, compiling might happen multiple times. After that, one of the compiled regexes will be used. When a SyntaxSet is cloned, the regexes in the cloned set will need to be recompiled currently. For adding parallelism to a previously single-threaded program, the recommended thread pooling is rayon. However, if you're working in an already-threaded context where there might be more threads than you want (such as writing a handler for an Iron request), the recommendation is to force all highlighting to be done within a fixed-size thread pool using rust-scoped-pool. An example of the former is in examples/parsyncat.rs. syncat prints a highlighted file to the terminal using 24-bit colour ANSI escape codes. It demonstrates a simple file highlighting workflow. synhtml prints an HTML file that will display the highlighted code. Demonstrates how syntect could be used by web servers and static site generators. synstats collects a bunch of statistics about the code in a folder. Includes basic things like line count but also fancier things like number of functions. Demonstrates how syntect can be used for code analysis as well as highlighting, as well as how to use the APIs to parse out the semantic tokenization. faiyels is a little code minimap visualizer I wrote that uses syntect for highlighting. parsyncat is like syncat, but accepts multiple files and highlights them in parallel. It demonstrates how to use syntect from multiple threads. Gutenberg, a static site generator that uses syntect for highlighting code snippets. xi-editor, a text editor in Rust which uses syntect for highlighting. Scribe, a Rust text editor framework which uses syntect for highlighting. tokio-cassandra, CQL shell in Rust, uses syntect for shell colouring. 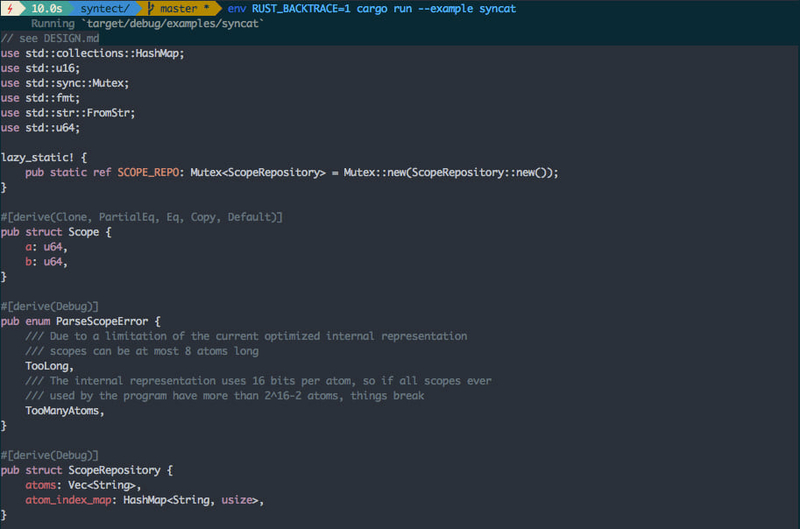 Cobalt, a static site generator that uses syntect for highlighting code snippets. catmark, a console markdown printer, uses syntect for code blocks. crowbook, a Markdown book generator, uses syntect for code blocks. syntect_server, an HTTP server for syntax highlighting. mdcat, a console markdown printer, uses syntect for code blocks. bat, a cat(1) clone, uses syntect for syntax highlighting. Thanks to Robin Stocker and also Keith Hall for making awesome substantial contributions of the most important impressive improvements syntect has had post-v1.0! They deserve lots of credit for where syntect is today. Thanks to Textmate 2 and @defuz's sublimate for the existing open source code I used as inspiration and in the case of sublimate's tmTheme loader, copy-pasted. All code (including defuz's sublimate code) is released under the MIT license.